Has His rushing wind filled your place? Has His Spirit consumed your space? Has His fire reached your heart? Has His love to never more part? Has His Spirit given utterance to you? Has your witness seen others through? Has your soul been filled so fine? Has it been Him talking in due time? Has His Spirit been poured to all? Has His wonders been given the call? Has this witness been a call to save? Has this witness freed those enslaved? The coming of God's Holy Spirit started a movement that has been passed down through the ages, a movement that will never be destroyed. (Matthew 16:18) That movement is recognized as God's church. Yes, the church started with the coming of the promised Spirit. 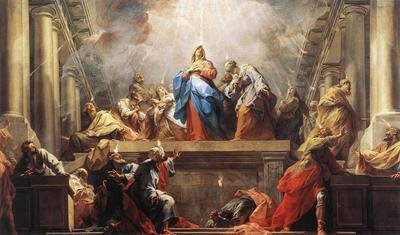 The day of Pentecost, as promised by our Lord, was surely a day of jubilation. Oh how we need that same out-pouring of God's Holy Spirit today, in our personal lives, as well as our churches. I've been around long enough to have seen the Holy Spirit work in many lives. Some would raise holy hands. Some would shout for joy. Some would quietly shed tears. While others would simply bend a knee in quiet prayer. You see, the Holy Spirit is a person, a divine person and member of God's Holy Trinity. He can and will get personally involved in your life, if you will but only let Him work His "Spirit Filled" deeds. The Scripture expressly says the Holy Spirit proceeds from the Father, (John 15:26) while the idea of His proceeding from the Son comes from such verses as (Galatians 4:6) (Romans 8:9) (John 16:7). The Spirit proceeded from them eternally and without any dividing of or change in God's nature. So, if you accept the Fathers grace by faith, (Ephesians 2:8-9) and accept the Father's Son for the remission of your sins, (John 3:16-17) you have the Holy Spirit living within you. However, it's up to you to request that the Holy Spirit take control of your life. So, are you filled with the Spirit?